What amazing and beautiful country – from Lake Argyle to the Bungle Bungles to the gorges on the El Questro pastoral lease. When I retired in early August, unbeknown to me my dear wife had arranged a celebratory trip for us to Kununurra and El Questro; I will be forever grateful!! It was one of those trips you might think about but never get ’round to so to do it was a great experience. We arrived in Kununurra on the Friday afternoon and my first question of Trish was – “What the hell are we doing in Kununurra?” But then I realised we were close to Lake Argyle, the Bungle Bungles etc..; I needn’t have worried as Trish had it covered! On the Saturday we did a tour that comprised flying to the Bungle Bungles and on the way flying over magnificent Lake Argyle – 1,000 square kilometres of water and home to some 25,000 freshwater crocodiles. It is something to see and hard to comprehend that so much fresh water is available in the East Kimberley. We also got great views of the Bungle Bungles. 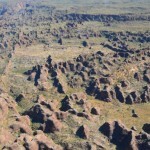 We landed on the Purnululu airstrip in the Purnululu National Park where the Bungle Bungles Range is located. Once there we boarded a 4 seat Robinson R44 Raven helicopter for our 30 min flight over the Bungle Bungles with the doors off!! What a great flight, with the doors off the view is unobstructed and is great for photos and just getting an overall view of the rock formations. We finished the day off when we returned to Kununurra by going to Kelly’s Knob with a drink and watching the magnificent sunset. Sunday arrived and we packed up and went to the airport with me thinking we were going home –but oh no!! We were sitting outside the airport terminal when a 4WD with El Questro on the side rolled up, Trish grinned at me, I said “No way! !” but next thing we were in the truck and off to the Emma Gorge Resort in the El Questro Wilderness Park. We stayed in a tented cabin that was cool and comfortable had its own en-suite. The resort grounds are magnificent and the resort as a whole has been built to merge with the surrounding environment. The staff are fabulous and to sit at night in the resort restaurant having a meal and a drink, enjoying the scenery, was a perfect way to end the day. On the Sunday we walked into Emma Gorge where Trish had a swim in what is very cold water. The walk wasn’t difficult and the scenery something to see with the flora and the tall red cliffs. We arranged a tour for the next day, Monday that took us to El Questro Gorge, Jackeroos Waterhole, Zebedee Springs and Chamberlain Gorge. It was a very full day but so good!! We went to El Questro Gorge where the flora is totally different to Emma Gorge; we both swam in the water at the end of the gorge, it not being as cold as Emma Gorge. From there we went to Jackeroos Waterhole for a look; a great place for a stopover and rest if you are driving the Gibb River road. It was then on to Zebedee Springs where the water is warm!! Once again some different flora from the previous gorges we had been to; at the end where we stopped are a series of pools fed by warm springs, really good to just lie back in and relax. The last place we went to was Chamberlain Gorge and we had to drive to El Questro Station to get to it. The Station was interesting and has cabins as well as an extensive camp site for travelers. We had lunch in the restaurant there looked over by a number of Kookaburras. The funny thing is the restaurant was not licensed so, to have a drink with your lunch you had to go to the Station store which is licensed and buy it there!! Chamberlain Gorge is on the Chamberlain River which flows past El Questro Station. We boarded a cruise boat to travel along the river so we could admire the colours and strata in the rock walls. We came across archer fish which, if you had your arm out of the boat with a bright watch or ring on, would take a shot at it!! – one lady had a fish shoot at her glasses!! There were also turtles and barramundi and we saw a rock wallaby with a joey in the pouch. We had a fantastic day, ably escorted by the rangers from El Questro and Emma Gorge Resort. Up on Tuesday for the trip back down the Gibb River Road to Kununurra and the flight home to Perth. To say I was spoilt would be an understatement; we had a wonderful time and thoroughly recommend going to the East Kimberley.